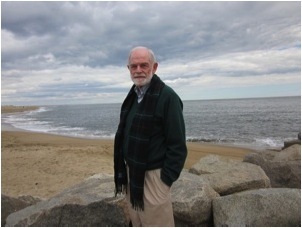 Edwin Lynn is the Minister Emeritus for the Northshore Unitarian Universalist Church in Danvers, Massachusetts where he served for 33 years. He also taught ministerial polity and practices at Harvard Divity School as a visiting lecturer and denominational counsellor after receiving the Merrill Fellowship there. After an auspicious beginning as "Most Likely to Succeed" in his Manchester, Connecticut grade school, he earned the more dubious distinction at high school graduation of "Most Changed Since Freshman Year". He graduated first in his class at the Syracuse University School of Architecture, but found that he enoyed reading and writing more than he did contruction of buildings. He became an educator with the Great Books Foundation which sponsors adult and children's discussion groups. This new path of examining and sharing perspectives on life led him to enroll in the Starr King School for the Ministry in Berkeley, California. His two careers in architecture and clergy melded into a love for church architecture which manifested itself in his first book "Tired Dragons" as well as a consultancy to churches helping with their building issues. His book "Shorlines" explores the lessons that shifting sand dunes, breaking waves, and mysterious cormorants lend to our lives. In retirement, he and his wife Marjorie spend a great deal of time at the beach and enjoying the coastal amenities of Ipswich and the North Shore of Massachusetts that has inspired him all his life.